After reading Melinda Beasi’s essay Twilight and the Plight of the Female Fan, I reached a strange epiphany. It’s okay if I don’t like Twilight! It’s okay if I don’t like Black Bird! It’s okay that I am never, ever going to enjoy reading manga like DearS and My-HiME! I am simply not the intended audience – and that’s okay. The point of Beasi’s essay is that fans should not judge other fans for being fans, even if they don’t personally enjoy the work that has inspired fannish behavior. Beasi has made this argument elsewhere, concerning shōjo manga and again concerning the Twilight fandom, and I agree with her. My own personal problem, however, is exactly the opposite. I do not get upset when people denigrate my interests; what upsets me is when I’m derided for not liking something that someone else feels I should. One of my weak points in this regard is young adult fiction. I used to love it, but I’m almost ten years past sixteen and am beginning to find myself growing impatient with the tropes of both American and Japanese novels written for teenagers. Certainly, not every book written for a younger audience can be The Golden Compass or Harry Potter and the Chamber of Secrets, but I still hold everything else to the same standard. This applies to Japanese light novels as well. Books like Nishizaki Megumi’s adaptation of Hot Gimmick and Coda Gakuto’s Missing series make me grind my teeth in frustration. Thankfully, there are young adult novels in Japan that are every bit as good as anything found in the West, and The Stories of Ibis is one of them. The Stories of Ibis is pure science fiction directed at a presumably teenage audience, and it can boast everything that is fun about young adult fiction. The prose is clear and concise while still being creative. The narrative is very forward-driven without neglecting character development. Stereotypes are clearly referenced but then played with and expanded upon. Finally, the overall mood of the book is refreshingly positive. As science fiction goes, The Stories of Ibis is overwhelmingly utopian, but there are still lots of quests and uncertainties to keep the reader engaged. 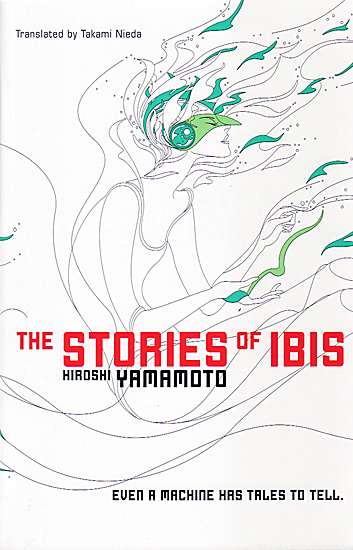 As the title suggests, The Stories of Ibis is a collection of six short stories and two longer stories connected both by theme and by a frame narrative. The theme is the reality of virtual reality and, by extension, the power of fiction. Ibis, a humanoid robot blessed with artificial intelligence, tells these stories to the narrator of the frame story, one of the last human beings on earth. In the narrator’s world, humans fear and distrust robots, and the narrator travels from outpost to outpost, spreading tales of humanity’s glory before the rise of artificial intelligence. The narrator is wounded in an encounter with Ibis, who had been searching for him, so she reads him fiction as he recovers. In between stories (in short segments marked as “Intermission”), Ibis and the narrator discuss the stories, and their relationship gradually changes and deepens. The first six stories are short, with each barely thirty pages in length. Only one of them is hard science fiction, and only one is strongly anime-flavored. The other four are set in more or less the present day and the present reality. All six deal with artificial intelligence or the reality of a virtual, fantasy world in some way. They’re all enjoyable; but, in my mind, the standout is the first story, in which people who only know each other through a Star Trek themed role playing site try to save one of their online friends from committing suicide in real life. The seventh and eighth stories are considerably longer than the first six, spanning one hundred pages each. I read a short review in Neo magazine that claimed that the two final stories made the book feel unbalanced, but I have to disagree. The final two stories are like a main course after an appetizer, and they are both excellent. Yamamoto reels his readers in with the first six stories and then lands us with the final two. “The Day Shion Came” is about a nursing robot that whose programming has been implanted with a kernel of artificial intelligence. The robot is given over to a young human nurse to train as the two go through their rounds at a senior care facility. Certain A.I. clichés apply to this story, but they are not the ones you would suspect, and they are challenged and reworked in surprising ways. If there is a literary genre of magical realism, then “The Day Shion Came” might be termed science fictional realism, as everything about it is simultaneously fantastic and mundane. The final story is the story of Ibis herself, who draws together all of the “Intermission” segments by explaining the history of the frame narrator’s world. A remarkable feature of this story is the language that the A.I. entities use to communicate with each other. It’s both interesting and intelligent, but never overused or explicated at length. I won’t attempt to describe it here, but let it suffice to say that I have no idea how the translator was able to handle it so successfully. I tip my hat in admiration of her efforts. In the final evaluation, The Stories of Ibis is a wonderful book for both young adult readers and adult readers who enjoy good young adult fiction. It’s neither too sci-fi nor too “Japanese” to put off people who aren’t fans of either “genre,” but I think it will still appeal to fans who are familiar with the tropes presented. In other words, like any good young adult novel, The Stories of Ibis attains the perfect balance of intelligence, accessibility, and creativity – and you don’t even have to feel embarrassed for enjoying it.